Well there has been quite a break between posts, but I did not forget to write. Like an amateur lover struggling to express oneself, I have been debating what to post that would seem useful and of interest to you internet folk. I know most of you are here to learn about design thinking, but I recently realised that I have not spoken much (in depth) about the nature of my research besides that it focuses on design thinking. So this post is going to act as a summary and explanation of what exactly I am doing every day- and with all of your hard earned tax. Sounds pretty broad, eh? Well it is. Generally in academialand it shouldn’t be, but in the case of design thinking it needs to be. My question is an exploratory one; meaning that I am investigating a “new” area that is under researched (i.e: does not have a large enough body of literature to build upon, hence the exploration). So you could argue that any kind of information I document on design thinking in complex environments is a contribution, but this wasn’t satisfying enough for me. A few gaps surfaced from my review of the literature. These gaps normally form the basis of your research investigation. What struck me from my literature review in particular was learning about the kind of evolution (or cycle*) design thinking appears to be taking. 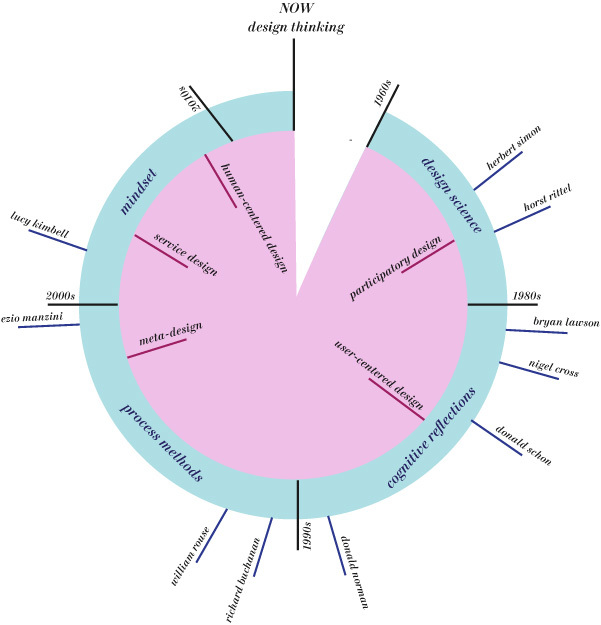 There is a lot of literature examining how designers work; research on students and professionals in “traditional” design fields such as product (engineering), graphic communication and architecture. But as practice evolved focused towards “higher” levels of design, such as service design, the amount of research literature available was pretty thin. 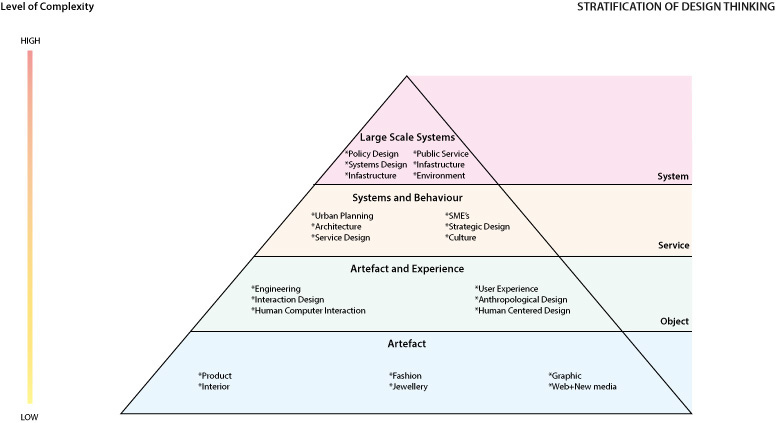 Not a lot has been examined empirically on higher levels of design practice- systems and services- and so it is this very current stage in the evolution of design thinking that I am investigating. emphasis on intangible design and/or sustainable problems. Operating in social networks. So referring back to my typology of design thinking (which I have now inverted upon the advice of a supervisor) the criteria for complexity is commonly evident in the fourth and third quadrants (system and services). You could argue that objects (products) may fit the above complexity criteria, but the design process of an artefact largely “ends” when the product needing to be made is constructed to the satisfactory requirements dictated by the client and/or materials (e.g: a new logo or chair)- and the brief provided is often more concrete. With systems and services, the requirements are extremely vague and ambiguous, often ill defined, and thus the solution is never complete as there are no hard specifications to design against. Furthermore, the design ‘object’ in complex environments is more conceptual than physical; with brainstorming sessions emphasising high-level ideas around experiences and connections, than textures, colors and size. In other words, the conversation does not begin as product/artefact centric. do you think this makes more sense inverted? The most interesting part about this area of complex design activity (3 and 4) is that the design project includes some kind of design activity from all levels of practice. There is often an overarching intention where a design team will create a high level design solution (or sometimes just intent). Once this high level solution is agreed upon, the focus converges towards specific deliverables (as the project is refined, design activity shifts down through the pyramid). The design work that follows supports the high-level design. Yet, in each level, dedicated and specialised design teams will often run through a full design process within the boundary of their project task in order to fulfil the overarching brief. For example: a dedicated design team will focus on service design and run through a design process methodology; drafting, prototyping and perhaps user testing the service idea. Similarly, when the service is complete and products have been built for it, a dedicated design team (level 1) required to communicate the new service offering through graphic communication (posters, websites, booklets) and will work through a design process of sketching, iterating and prototyping in order to come up with a final solution. BUT! These mini design methodology sessions all make up the broad, overarching design process. Think of a big daddy design (project) methodology cuddling little mini methodologies. This kind of structure was evident in the first two case studies I have analysed. In this example, you can see how the focus of design activity becomes more concrete and specific as you move through each level. A complex design project will begin at level 4 or 3 with a broad, holistic and systemic focus around the problem at hand and the intention behind resolution. It is interesting to note that design activity at its highest level is really all about the (design) thinking. Design methods are involved but become more prevalent as the solution shifts through each level, gaining tangibility. Once the high level design is established, the project will (generally) move to some sort of service design, before shifting into a product design phase and finally a communication design phase. Enough of that. What exactly are YOU focusing on? Depending on the epistemology and methodology, a research student might narrow case study research to one particular industry/context, say, large private organisations or public sector services. Doing so has a range of benefits (rigour, consistency, etc). Of course for me I hate consistency and love a bit of intellectual masochism, and as a result, chose three different contexts to study. 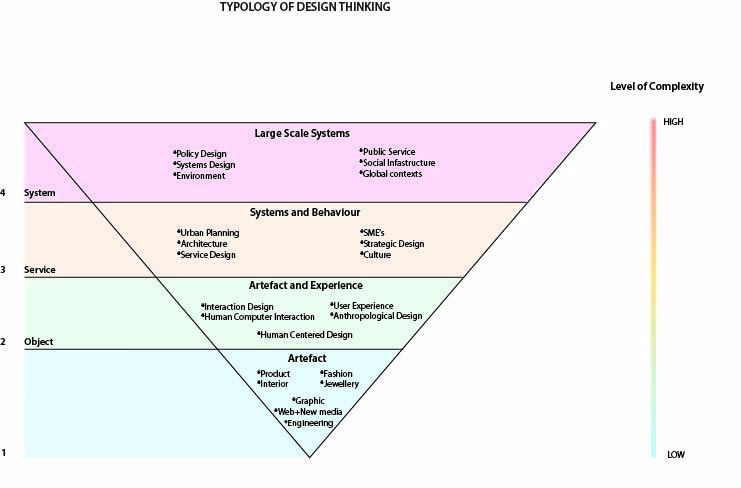 Adding another layer to the focus of my research, I have also chosen each case deliberately for the position of design thinking in relation to the problem. That is, the first case explores the application of design thinking external to the organisation (problem), the second is an example of the application of design thinking internal to an organisation, and finally the application of design thinking in an open collaborative environment (without a perceived governing design agency or organisational body). I will have to explain in more detail in another post why this collection of cases is so interesting. Geez… I’m sorry guys. I lured you into a blog post about my research and kind of ended things just as I was about to tell you what my PhD is all about. Long blog posts are pretty time consuming to read, so I think it’s best to end things here and follow up later with a deep explanation on why I chose the cases that I did and why research into design thinking in complex environments is important. I did warn you all in my about page that I like to ramble, didnt I? 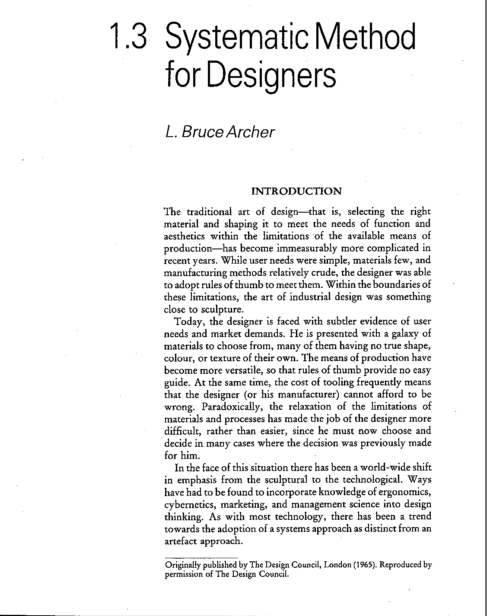 *i say cycle here because if you take into account the history of design thinking, particularly papers during the 60s-70s (i.e: the first wave) many actually discussed high level design. For example: Rittel and Webber’s paper, Dilemmas in a General Theory of Planning. **I deliberately chose the word environment rather than problem as using the word problem would be confused with the term ‘wicked problems’. Furthermore, an environment can contain complex problems and situations. 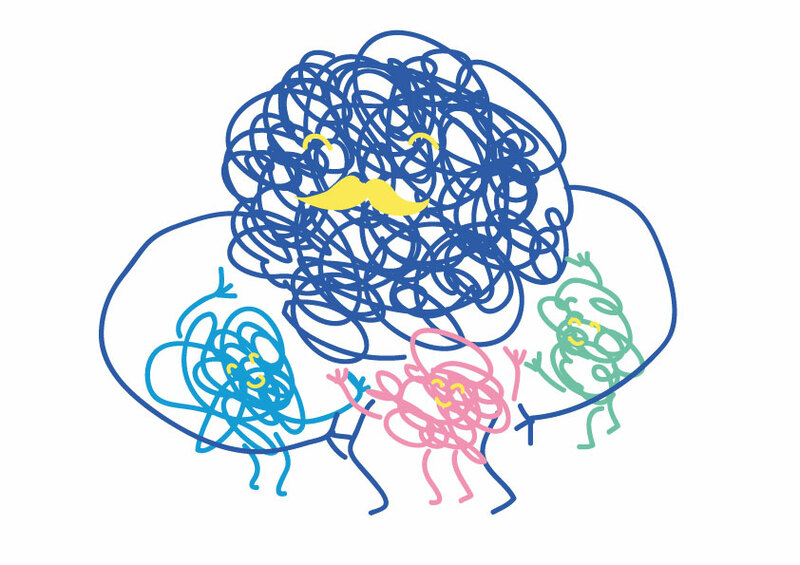 For example: a basic problem in a very complex network of stakeholders is still a complex environment. Using the word ‘environments’ allowed my research to look at both complex problems (in simple contexts) and complex contexts (but simpler problems). **** I should also add that the ideas presented here are my own concepts taken from my thesis. Thus, if you like please cite! Heeeere we go again. We are moving forward, i promise. Design thinking took a bit of a dive in 2012 after some negative critiques (et tu, Bruce?) but has recovered in recent months with a resurgence of literature and discussions on the topic. Mainly driven by academia, design thinking is *slowly* becoming a household name, particularly thanks to new government initiatives happening globally; APS Innovation Plan, the European Commission, to name a few. Lucy Kimbell, an intelligent and all-round respected researcher, recently published a blog post on the situation of design thinking in public services. The post comprised of comments made by herself to the Design Commission Inquiry into Redesigning Public Services. I was alerted to this post during discussions with @TaylorHaig whom suggested i have a read. There was just too much to say about the subject over Twitter so i took to WordPress. Take this as my comments on Lucy’s comments on the design commission inquiry. Of course i would also love to hear your comments on my comments on Lucy’s comments, too. One of the first things to address is that even if you’re in design, it’s incredibly hard to define what design is. […] And even if you look at the academic literature on design, there are two major distinctions, which then come out – is design about giving shape and form to things? And that thing could be a physical product or it could be a digital interaction. Or is it about making change happen? everyone who devises courses of action, to change existing situations into preferred ones, is doing design. And if you say that to a doctor they think ‘well I diagnose and then I’m trying to change the state of the patient – which has a physical effect – so yes’. But then you have this problem which some designers go into of saying actually ‘design is everything’. If you push it that far you are saying design is everything, and therefore designers can tackle anything. Which is not necessarily the case. So that definition on the one hand seems right, but it also alludes to this question about design and management – are they really different? So the problem we have here with this appropriate and famous quote from Simon, is that it is so general that it could be broadly applicable to pretty much any intentional action. This is where Lucy rejects the idea of ‘design is everything’. Unless we devise a new quote for design practice, design will be seen as the governing force behind pretty much anything. Kind of like gravity. But if we try to ‘design’ a new definition of design, it must be broad enough to allow room for adaptation and evolution and confined enough that it has its own identity. 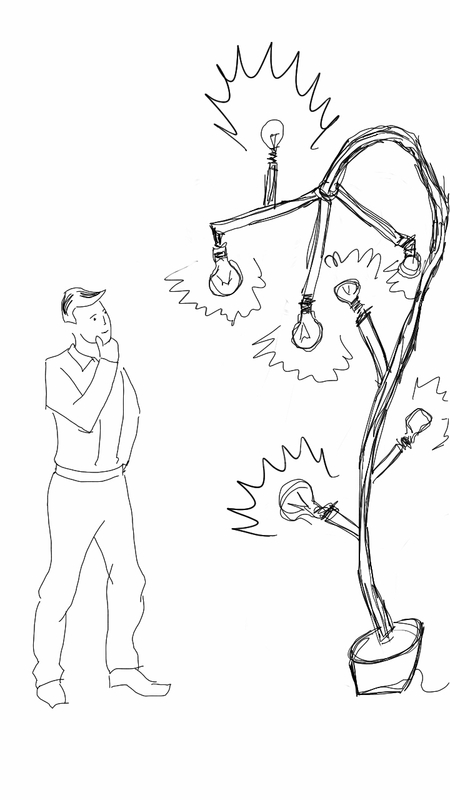 Designing a definition for design IS the ultimate wicked problem (oh the irony!). This is now where i need to point out that Simons quote only describes one half of design practice- the act of designing. It does not define the thing (noun) that is a design or objects that together make up particular designed thing. To answer this issue, as Lucy describes, we need to get into characteristics which make up what designers do- what is it that makes their work classify as design practice? And what characteristics make a designed thing? Traditionally, design did have a very clear practice. Its not so much that traditional design practices were rigid and ‘boxed in’, it was that the designers knew their place. It wasn’t until the emergence of ‘higher’ level design practice that things started messing with peoples heads. If you look at traditional design areas such as industrial/product design, graphic design, architecture and fashion design, each sub-discipline knew what it needed to know in order to intentionally act to design a meaningful outcome. The characteristics of doing fashion design were dealing with textiles, understanding the body, stitching, creating garments, etc. In graphic design you work with typography, white space, publications, logos and branding- graphic designers generally don’t deal with the contours of the body. With the exception of packaging, graphic design is essentially confined to 2d collateral. There are technical rules and specifications that need to be adhered to in order to adequately complete each traditional design practice. Traditional design crafts have clearer guidelines; the final output is tangible and largely dependent on the ‘designer’ and/or design team. What technical guidelines are present for complex design practice; that which does not necessarily involve tangible outcomes and involve a larger number of co-creators (stakeholders)? What guidelines must this area work within? What techniques need to be learned in order to create appropriately designed outcomes? Once we sort these details out, we will be better able to define what exactly constitutes doing what Buchanan describes as ‘higher order’ design and design thinking. Most recently, Donald Norman did a double-somersault backflip and decided that yes, there is such a thing as design thinking and yes, it is actually quite special. Similar to what I have mused about in previous posts, Norman admits that design thinking is not a cognitive practice unique to designers, but displayed by those who ‘question the norms’ and thus break out and innovate. Having the father of user-centered and human-centered design, and previously the worlds biggest design thinking skeptic, admit to turning a new leaf for design thinking is a pretty momentous occasion. Does this mean that in spite of all of the skepticism and backlash in 2012, professionals are starting to realise that there is in fact merit in the art of design thinking? Will this be the return of the Jedi? 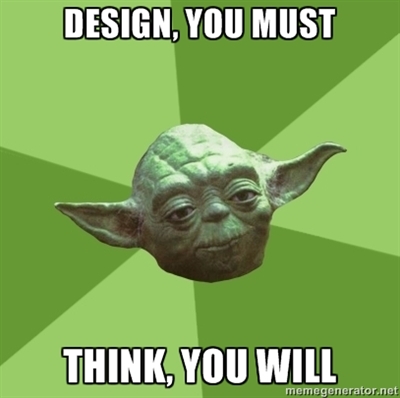 May the (design) force be with you. I spent months torturing myself over what episte i was going to take. Despite my supervisor claiming its not really a big deal, i felt that choosing the right theory of knowledge was imperative, especially for the credibility of my data. The importance of choosing the right episte became apparent to me more so when i realised that i was entering unknown territories in research- especially design research- because the kind of topic i am undertaking is not conventional. The kind of epistemology you choose to guide your research largely depends on the question asked. Different fields of research assume common epistemological and methodological procedures due to the nature of the work. For example, in the field of anthropology where majority of research questions surround cultural investigations on semiotics and constructions of meaning, a constructivist or even subjectivist approach is assumed and appropriate. In the field of psychology and behavioural research, questions seek quantitative data and often follow a more scientific (positivist) approach. Thus, scientific research assumes a positivist position and can also be termed ‘reductionist’. You will have to excuse my rather crude explanations- there are indeed more epistemological ‘-isms’ used in each field of research but i am just covering the most common. I am not claiming to be an expert on the topic of doctoral research in design, but ive read enough about design research to form an opinion that makes me believe design research hasn’t found its own episte yet- especially for higher orders of design. To me, borrowing epistemologies from other fields is not allowing for the scope of complexity that is required in this field. The slippers dont quite fit. As a relatively new industry, design research has been stuck in an awkward teen phase- trying out different epistemological trends to see what works. In the process of finding the right shoe, the design industry has evolved (and technically returned to) a new scope of practice- thats is the (re)focus on design thinking in highly complex issues such as systemic design and social innovation. 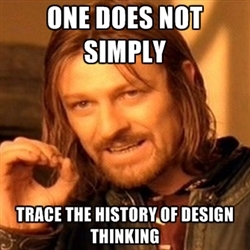 This has thrown up all of our most common methodological approaches previously used in design research. I need to now highlight why, in context of our new design sphere, the epistemological positions we have been using thus far are falling short. So what epistemology fits with this new scale of design? On the one hand, this area of design deals with social constructions of meaning and culture, with the artefacts and results that are produced to improve on what society values. On the other, it interacts with complex systems that depend on ‘objective’ (technological and environmental) forces that operate independently from what we construct of it. It’s not enough to research design from a purely subjectivist lens; one that favors intrepretations on human constructions of meaning and intent. Its not enough to research design from a purely objective lens; one that favors a quantifiable view of social process and ignores cultural meaning and values. Design largely is the combination of both these extremes so it makes sense that to perform adequate research in design- especially complex design practice- that we find a middle ground for our theoretical stance, one that acknowledges the importance of both socially constructed meaning and external forces. This middle ground can be found from using a critical realist perspective. This is where i get into the nitty gritties of the most commonly used epist’s in design research and compare these with a critical realist approach. Below is a table taken from Luke & Melles paper but originally found in Michael Crotty’s book, The Foundations of Social Research: Meaning and Perspective in the Research Process. 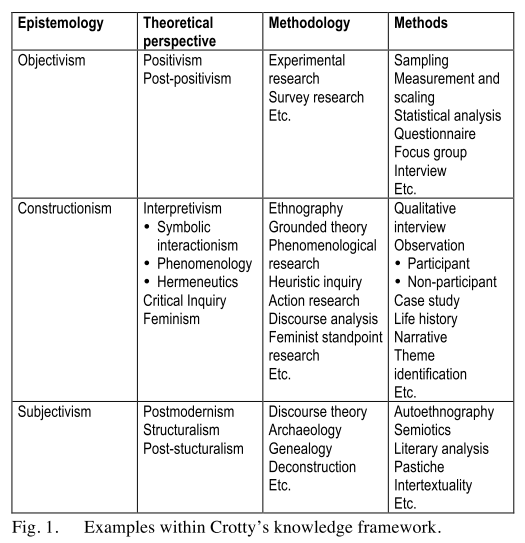 The following table is a nice concise outline of the main epistemologies in design research, along with the related methodology and methods of investigation. I should note that debates over whether critical realism is an epistemological or an ontological theory are still performed today. The general consensus is that it is an ontological theory, but ive placed it under epistemology for simplicity. 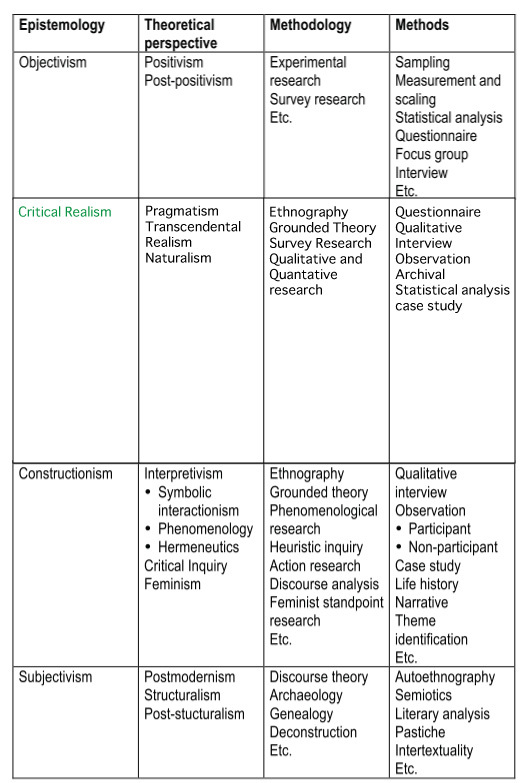 The theoretical perspectives listed here for critical realism are also epistemologies but ive placed the information in this way to show that critical realism is a combination of pragmatic and realist theories. The following contains jargon. If you feel you dont need to brush up on the details behind critical realism (though i highly recommend it, even just for fun. Yes, i said fun) you can safely scroll down to the more practical explanation of the theory. Critical Realism was first proposed by Roy Bhaskar in the 1970’s as an alternative theory aimed to bridge perspectives from the arts and sciences. I dont really recommend you read Bhaskar, as his texts are infamous for being convoluted to the point where you think he himself doesnt quite understand what he is saying. So thankfully a whole group of smart academics such as Sayer, Danermark, Eckstrom and Dickens published a range of books and papers clarifying and expanding on the theory, saving us mortals from Bhaskar’s intense philosophies. 1. Knowledge is a product of society, but knowledge is not only a product of society. It can refer to real processes and mechanisms in the world. 2. Science is about establishing the causes underlying phenomena of interest. Real, relatively enduring structures and causal mechanisms in the physical, biological and social worlds underlie what we observe and experience. They do so in combination with one another and often in combination with contingent circumstance. ‘Closed systems’ are created artificially to develop understandings of causal mechanisms, but these are rare in society and nature. 3. The world is envisaged as heirarchically stratified. At the most general level are physical mechanisms (e.g. Gravity). At ‘higher’ level are chemical structures and mechanisms. Higher still are biological mechanisms (e.g those generating an organisms growth). Finaly, there are physchological and social mechanisms. Mechanisms at each level of reality are rooted in- but not reducible to- those operating at lower levels. 1.The world exists independently of our knowledge of it. 2. Our knowledge of the world is fallible and theory-laden. Concepts of truth and falsity fail to provide a coherent view of the relationship between knowledge and its object. Nevertheless knowledge is not immune to empirical check and its effectiveness in informing and explaining successful material practice is not mere accident. 3. Knowledge develops neither wholly continuously, as the steady accumulation of facts within a stable conceptual framework, nor discontinuously, through simultaneous and universal changes in concepts. 4. There is necessity in theworld; objects—whether natural or social— necessarily have particular powers or ways of acting and particular susceptibilities. 5. The world is differentiated and stratified, consisting not only of events, but objects, including structures, which have powers and liabilities capable of generating events. These structures may be present even where, as in the social world and much of the natural world, they do not generate regular patterns of events. 6. Social phenomena such as actions, texts and institutions are concept dependent.We not only have to explain their production and material effects but to understand, read or interpret what they mean. Although they have to be interpreted by starting from the researcher’s own frames of meaning, by and large they exist regardless of researchers’ interpretation of them. A qualified version of 1 therefore applies to the social world. In view of 4–6, the methods of social science and natural science have both differences and similarities. 7. Science or the production of any kind of knowledge is a social practice. For better or worse (not just worse) the conditions and social relations of the production of knowledge influence its content. Knowledge is also largely—though not exclusively— linguistic, and the nature of language and the way we communi- cate are not incidental to what is known and communicated. Awareness of these relationships is vital in evaluating knowledge. So as you can see, critical realism acknowledges that there is both an external reality where natural processes operate (nature), but that also this reality can include social processes that operate independently of our observation and interpretation of them. The critical realist perspective still lies in constructivist reasoning (as oppose to scientific experimentation/testing), but unlike most subjective epistemologies that deny an external ‘truth’ , critical realism understands that a mind independent reality exists. I was going to briefly get into descriptions of how critical realism operates but felt that researchers can familiarise themselves with the texts and that practitioners may not need to know the nitty gritty philosophical descriptions for practice. This brings me to the next point: how critical realism can be used in practice. Enough with the blah blah, get to the point! What critical realism can teach practitioners is to understand when a system is closed and tame or open and complex (wicked). Essentially most complex designs deal with ‘open’ social systems that are forever in a state of ‘flux’. Most designers working in this area will already know that this is the case, however, many struggle to formulate flexible and adaptable solutions. In order to do this, research and analysis needs to unify information from both specific social values as well as wider objective forces. Easier said than done, right? But critical realism can offer a guiding methodology on how to investigate and analyse complex data to design better informed solutions. It opens the scope of research and provides a methodology that can guide practitioners through the messy process of sense-making, particularly when it needs to harmoniously unify data on specific social needs and external impacts. Sound familiar? That is because it echo’s Simon’s theory of ‘satisficing’ in the face of complex systems that are constantly evolving. Critical realism is fundamentally about dealing with and making sense of complex, evolving problems. It is especially useful when applied in sustainable practice. If we are going to march forward in the pursuit of a sustainable future, we CANNOT distinguish ourselves or our ‘being’ in this world as completely separate from the ‘other’ (the environment). I know this sounds a bit heideggarian, and it is, but this general attitude has largely dominated the last century. I know this also sounds like a grand generalisation, but how many of you consciously consider how you are connected to your environment? 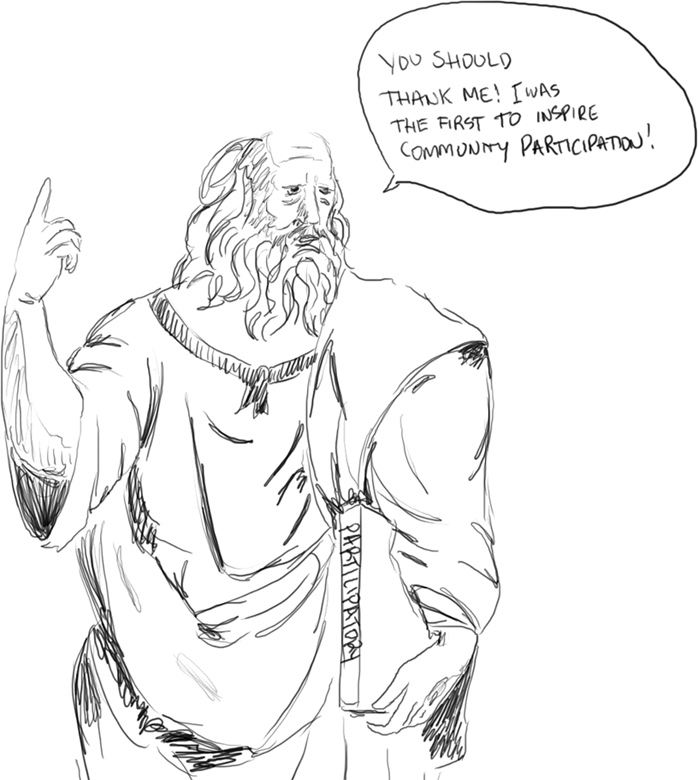 or even your wider social community? Didnt think so. Our earth has for too long been a commodity. We dont consider ourselves as an extension of our natural environment and many of us barely consider the environment in connection with our daily actions. Many might question what exactly is ‘natural’, but i find in the face of climate change and increasing social and cultural unrest, these philosophical questions deviate from action so i am going to leave the dirty questions on hermeneutics and ontology to the philosophers. The basic fact is, we have become completely disconnected from our ecosystem- both social and environmental. If individuals are not going to consider this fact and designers consider themselves the key to social change, then designers must start approaching problems with a connected mindset that acknowledges our intimate relationship with our social and natural environments. In context of the above, you can see why a critical realist perspective in design is so important. For research like my own where we begin to look back to natural structures and apply these learnings to design more sustainable social systems, a theory that acknowledges both the social and natural realities is fundamental. This perspective is equally important in practice, as more designers attempt to bridge social and environmental problems. No longer should the social and the scientific be at war and our sense of self be separate from our external reality, as critical realism is paving the way towards unification through transdisciplinary research. This is where things get a bit hazy. Design Thinking and all that it stands for today did not directly come out of the history I outlined earlier- it simply proves that design thinking has a history. Design thinking was a realisation through the evolution of different (collaborative) design process methods that were developed to improve and extend design to other areas of practice. What happened from the mid 1980’s to date was a race to discover new methods for improving business, service and design. Each methodology can be traced through history and analysed independently should you wish to interpret historical readings in context of the method under investigation. I will highlight an example of what I mean as we move along. The purpose of analysing this period was to understand the evolution of major design process methods and to discover from this evolution the moment when design thinking was realised as a new approach and a way of thinking that underlined all other methods before it. It must be noted that through this development there was no clear linear progression of methodologies that arose, as many were developed at the same time in different faculties and industries. I have taken through much reading a very generalised approach at attempting to create a chronological understanding of the evolution of major design process trends. The purpose of doing this is to objectively clarify the history and evolution of design thinking which has been muddy and conflicting to date. In the early days, participatory methodology was seen most commonly in urban planning until recent developments in design gave this method its name. As i stated earlier, one could very easily trace the history and development of participatory design in and of itself- independent from design thinking. For example; If you want to get nit picky about history, participatory design can be traced all the way back to Plato’s Republic. Grass roots democracy was once the heart of participatory methodology and is an established method used for centuries for the development of a harmonious society. But i am here to discuss how this and other methods (each with their own unique history) have come together to form the evolution of design thinking. Fast forward from Plato to the 1960s. During the design methods movement, participatory design was gaining momentum through research. Dubbed the Scandinavian approach, participatory design was about integrating end-users into the development (prototyping) phase of projects. Technological developments during the end of this decade saw participatory design shift from a social method to a technological one. Prior to the adoption of PD in technology, systems design was the go-to for engineers prototyping within an iterative framework. As PD progressed into the 1980s, it became synonymous with the emerging field of interaction design. Many of the techniques used in PD were borrowed from science, such as usability testing. Others included mock-ups, prototyping and even role playing. 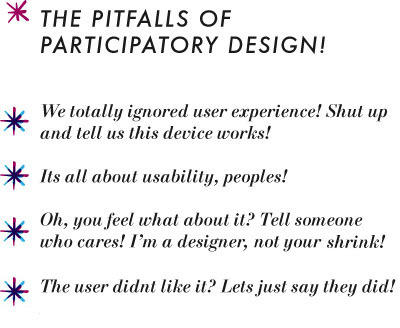 One of the main disadvantages of participatory design is its negligence towards user experience and stakeholder input. Usability was king, but emotional response to gadgetry was largely ignored. In many instances user testing was abandoned, when users decisions conflicted with those of the stakeholders and the designers. In response to this end-user dilemma, discussions surrounding co-design (co-operative design) or collaborative design began to take place. This alternative method aimed to transform passive users into co-operative designers. 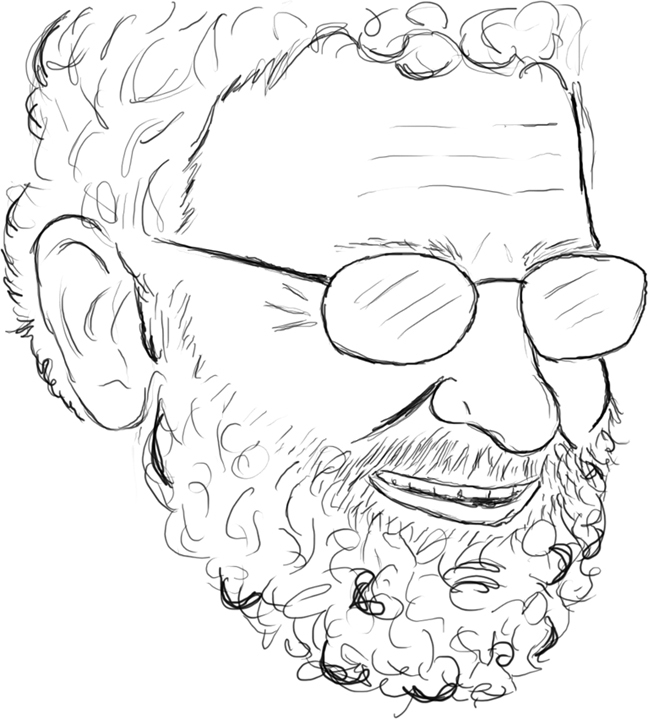 The most significant contribution to the transformation of user development in design was introduced by design theorist Donald Norman. Donald re-defined participatory design into what he coined as user-centered design. User testing became less about usability and more about a users interests and needs. Norman favoured user-control and humanised participatory and system design by “making things visible”. This was to ensure users could discover errors and have control over resolving them. Another significant shift in ideology from participatory to user-centered design was the placement of user at the center of the development process. It highlighted the benefits of understanding user experience over user testing. Owing some of its methodology to behavioural sciences, user-centered design emphasised experience over efficiency and adopted a more humanistic approach with the involvement of the user throughout the development of a product or system. User-centered design grew out of speculations towards elevating users from guinea-pigs to co-developers of systems during the participatory trend. This new methodology incidentally spread into broader areas of industry and practice. ‘[it] Draws on several traditions including product, environment, experience and interaction design” (Kimbell 2009, p. 250). Kimbell and a few other scholars discuss a new perspective rising in business; from a closed value chain (i.e: we punched out a product we tested on some monkeys and know it works so we can forget about it) to understanding how and what the user **does** with a product (or service); including their journey and experience. This perspective is another step forward in the evolution of design methodology, for rather than thinking about end user experience of a product or service (user-centered design) attention has shifted to understanding the use, interaction and journey of that product/service after it has left the hands of the provider. So now we find ourselves labelling all products and systems as one service unit. Kimbell argues that the distinction between a service and product becomes irrelevant, for everything is a type of service that plays a role in ‘value creation’ (Kimbell 2010, p.3). Furthermore, service design extended the definition of the ‘user’ to include all stakeholders and individuals affected or interacting with the service system. It was with this new approach to product/service systems that the idea of a holistic mindset was made evident. And the holistic mindset behind service design owed much of its development to Ezio Manzini through his research in service marketing and meta-design. Additionally, many of the methods used in service design today have been borrowed and adapted from anthropology and marketing. Most importantly, it is the holistic perspective of service design that distinguishes itself from all previous design methodologies. 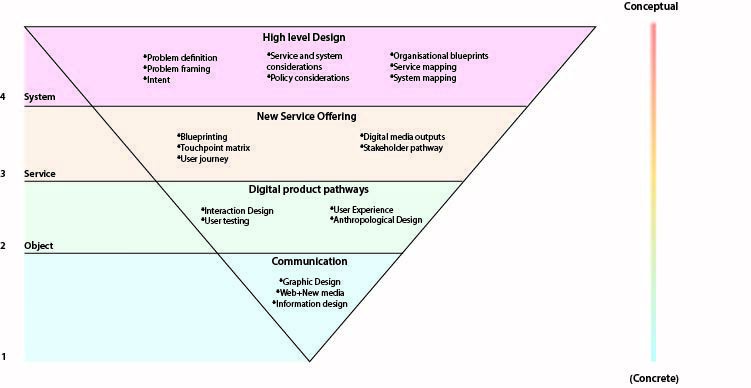 Rather than focusing on the ‘end user’ (the customer: marketing/user centered and participatory design), service design seeks to collaborate with all users of a service; building relationships between stakeholders to open up communication for the exchange and development of value and knowledge. Since the early 1990s, human-centered design and user-centered design were often interchangeable terms regarding the integration of end users within a design process. Like many other design methodologies, human-centered design first began within technological and product system industries and was growing under human centered interaction (a method that is still in use). Human-centered design only started to evolve around the late 1990s, when the development of methods described above shifted from a techno-driven focus to a humanised one. limitations and foster user acceptance” (Rouse, 1991 pp.6-123). Despite contextualising his defintiion within the field of systems and product engineering, Rouse introduces a broader perspective of the ‘user’- one that is closely related to service design but situated in a broader, more socially conscious arena. In its final (and current) phase of evolution, HCD is seen to hold potential for resolving wider societal issues. HCD is a mix of meta design and service design but closely related to anthropology. It is used more generally in social development than service development. The broad holistic perspective introduced in service design allowed for human-centered design to redefine its meaning. Coupled with significant social and environmental disasters, it was appropriate after the turn of the millenium that HCD transformed from a method to a mindset, aiming to humanize the design process and empathize with stakeholders. The mindset approach of human centered design re-introduced design thinking, but this time as a mindset used a method for interpreting wicked problems. It is interesting to note that the shifts in design theory and practice that have occured since the methods movement in the 1960s have mirrored one another. Design-as-science trend of the 60s and 70s sit opposite and reflect the methodical inquiry into process methods of the 1990s. Similarly, cognitive reflections in design theory during the 1980s reflect (and sit opposite) the mindset movement we are moving through now. Though this may not have been the best way to depict the timeline of design theory and thinking (infodesign nerds get off my back), I chose a circle to deliberately highlight these reflections and the very fact that we have almost come full circle. If this pattern is correct, we should find ourselves moving back into a scientification (did i make that word up?) of design, and it seems to me that we are already beginning to shift into it; as developments in neuroscience turn attention to design thinking for study. To highlight my prediction on the next phase in design, here is a Stanford video on the neuroscience of design thinking. Enjoy.